I am registered with the United Kingdom Council for Psychotherapy (UKCP). I am a member of the Humanistic and Integrative Psychotherapy College, the London School of Biodynamic Psychotherapy (LSBP), and The Institute for Arts in Therapy and Education (IATE). In 1986, I completed a four year training in Biodynamic Psychotherapy at the Gerda Boyesen Centre, London. Since then I have been practising in north London. Integration: Over the last 30 years, I have integrated humanistic, relational and psychodynamic approaches into my practice. Being an integrative psychotherapist means that different approaches can be used to best meet the particular needs of the client. Partnership: I understand the importance of providing a safe and welcoming space for my clients. I see the work of psychotherapy as a creative partnership - client and therapist work collaboratively to foster the sources of strength and healing in the client. Feelings and beliefs: Psychotherapy provides a space for experiencing one's emotional life, and for making sense of feelings and patterns of behaviour. It helps us to identify and re-evaluate core beliefs, as well as to understand the impact those beliefs have on everyday life. Relating: I aim to support my clients on their journey of discovery of what it's like to be fully themselves; at the same time, supporting them in establishing more fulfilling ways of relating to others. The body: I have found that psychological change involves shifts on the body level. Emotional, mental and spiritual energies have a home - through body awareness one can facilitate psychological transformation. Including the body brings the possibility of being fully present in the moment. At times, simply being with what is and paying attention to the flow of energy in the body can bring about the most profound, and often wholly unexpected, insights and changes. Women's issues: I have a particular interest in women's issues. I have supported women on their journey to empower themselves, in building a healthy relationship with themselves and their bodies. I have supported women in their search to make sense of their childhood experiences, their relationship with their parents, their partners, their work, their children, and their role as mothers. I work with mothers and their babies experiencing attachment difficulties. I also have experience working with women who have eating disorders. There are many reasons for considering psychotherapy, including a feeling that life could be more fulfilling. Some people come because they feel they they would benefit from the support, and from having a space where they can unburden themselves and speak freely. Others come because they're looking for a place to engage with existential and spiritual issues. Some people come aware of the need to experience themselves in their bodies. The initial session is an opportunity to meet and determine whether we could work together. It is also an opportunity to assess your needs, and ask questions. Sessions cost £60 and last for an hour. Usually, clients come for weekly or twice-weekly appointments. As well as my psychotherapy practice, I supervise psychotherapists and counsellors. I see couples for couple counselling. I work with mothers and their babies who are experiencing attachment difficulties. I take protecting my clients' confidentiality, anonymity, and privacy seriously. I hold their contact details (name, address, phone number, email address). As well as a record of sessions - date and themes, which are kept separately from the contact details, and are anonymised. All data is kept securely as a paper record, under lock and key. It is shredded 7 years after the work has come to an end. I will only use a client's phone number, email or address to make contact regarding appointments. Clients have the right to ask for a copy of the information I hold about them. They may ask to correct or remove information. 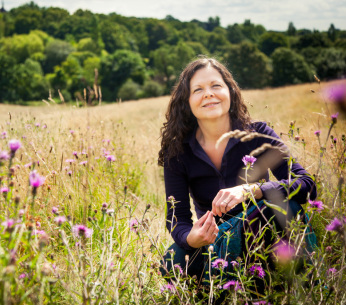 Miriam Salles - Integrative Psychotherapist - I am registered with the United Kingdom Council for Psychotherapy (UKCP) and the London School of Biodynamic Psychotherapy (LSBP).